The Dotul Heavy Duty Door Unloader is used to off load doors from a vertical door machine on to an assembly table or door cart. The unloader eliminates the need for the operator to physically pick up the door, rotate the door and place it on an assembly table. Built into the operation of the unloader is a feature which allows the operator to stand the door straight up once the door has been positioned on the unloader. 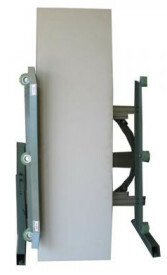 This gives the operator an ergonomically friendly lifting position so the door can be placed on a door cart or rack.